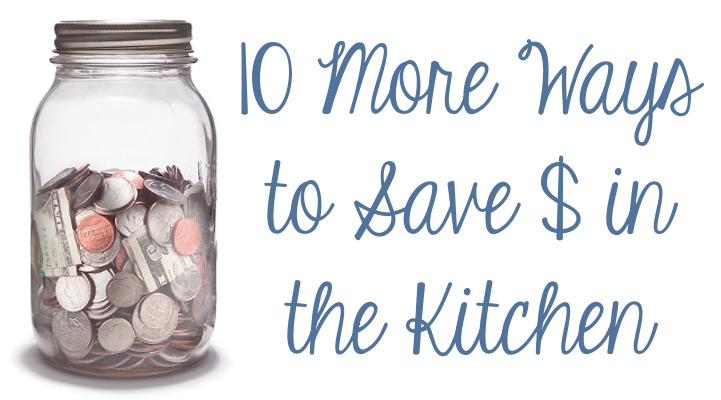 This is the second of a 2-post series on ways to save money in the kitchen! If you missed my first post, click here to read it. Beans, rice, ramen noodles. Add these things to your meal planning to offset the cost when you want to have something nicer. There’s a lot of ways to doctor-up ramen noodles, too. I’ll post some of our favorite ramen recipes in the future! If your shopping day is approaching and your fridge looks pretty full, just don’t go shopping! Matt & I are in the middle of a no-spend week right now. We’re going out of town this weekend and I have a freezer-cooking party planned for next week. I figured we could get by with what we have on hand until then, so we just didn’t buy groceries this week. You will survive, I promise! Don’t buy fancy spices for just one meal. Figure out what spices you love and stick to them. Spices are pricey! Meats can add up. Have one or two nights a week where you go meatless. Make a quiche, stir fry, grilled cheese sandwiches, etc! Most dishwashers have a disposal these days. If you are going to spend 10 minutes pre-washing, you might as well consider them washed. Pick one, no sense using double the water and energy. There are loads of inexpensive recipes floating around out there. Try one of these…click here, here, or here! Don’t sweat it if the pickings are slim a few days before your shopping day. Challenge yourself to make a good meal with only the ingredients you have on hand. I’ve learned several new recipes this way and it has definitely strengthened my cooking skills. If you are cooking for 1 or 2, sometimes it’s hard to justify buying stuff that you won’t have time to finish before it goes bad. When I buy bread, tortillas, bagels, etc. I immediately put half into a freezer bag and freeze for later use. If you get to the store and see an awesome deal on ground beef don’t pass it up just because it wasn’t on your list. Change your list on the fly! Buy the sale item and adjust your list to keep under budget. Just be thankful for the food you do have. We are so blessed to have the resources we have here in the states. Think of what it would be like if you lived in a 3rd world country…suddenly those rice and beans will seem a lot more appetizing. Everything we have is a gift from God, so don’t complain if you don’t have exactly what you ‘need’ for the perfect meal. Just be grateful you have food….period. I hope these two posts have been helpful. I’d love to hear other ways you save on your grocery bill!